As we close the door on the fabulous exhibition from the Seven Painters we open the door to Ellie Hannon and Damien Slevin. Two different, exciting and enticing exhibitions that continue to highlight Newcastle’s position as a major contributor to the Australian and international art scene, open on 30 July at Newcastle Art Space. Ellie Hannon “Traces” in Gallery 1 and Damien Slevin “Windows” in Gallery 2. Coffs Harbour raised Ellie Hannon is passionate about art and is committed to the idea of art accessibility. To this end, Ellie raised funds and collaborated with an existing art collective ‘Rumah Kreatif’ to build a community art space in Jatitujuh, Indonesia. Ellie refers to this on her blog as being as a place of creation, collaboration, experimentation, discussion, performance, education…. 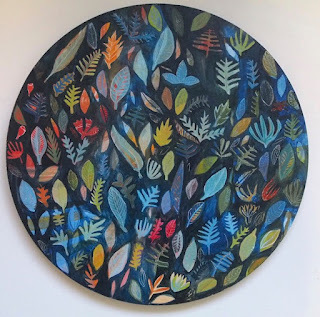 When I visited her in her studio at Newcastle Community Arts Centre to see her works in progress, Ellie talked about her interest in pattern and repetition and showed me circular wood panels and some larger rectangular works. 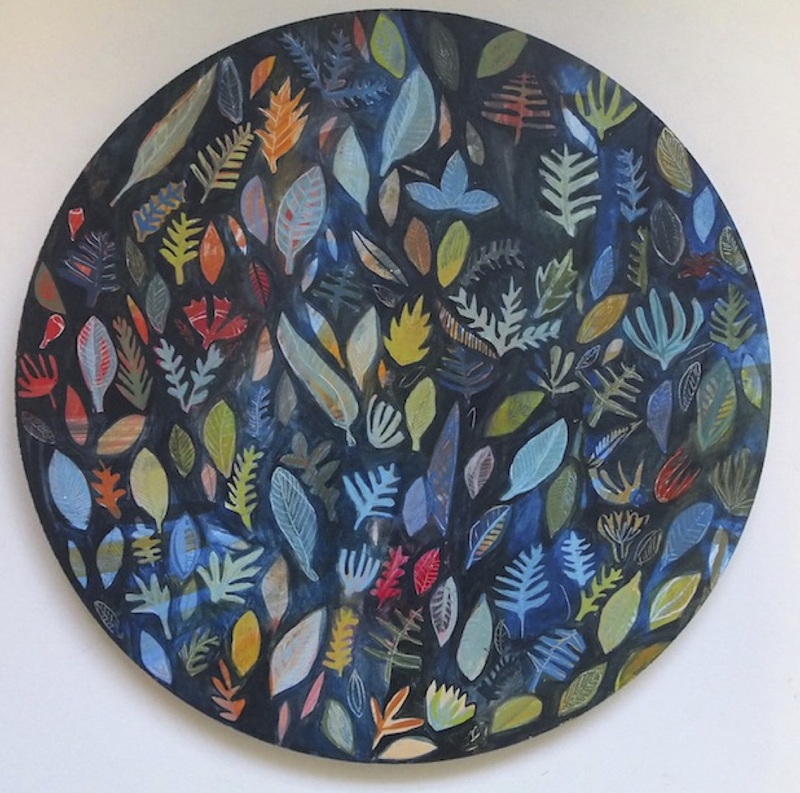 The circular panels utilise Ellie’s soft colour palette choices and reveal finely drawn organic and leaf-like patterns. Historical layers were often scratched and wiped back in areas to allow the application process to reveal itself as traces of the past. 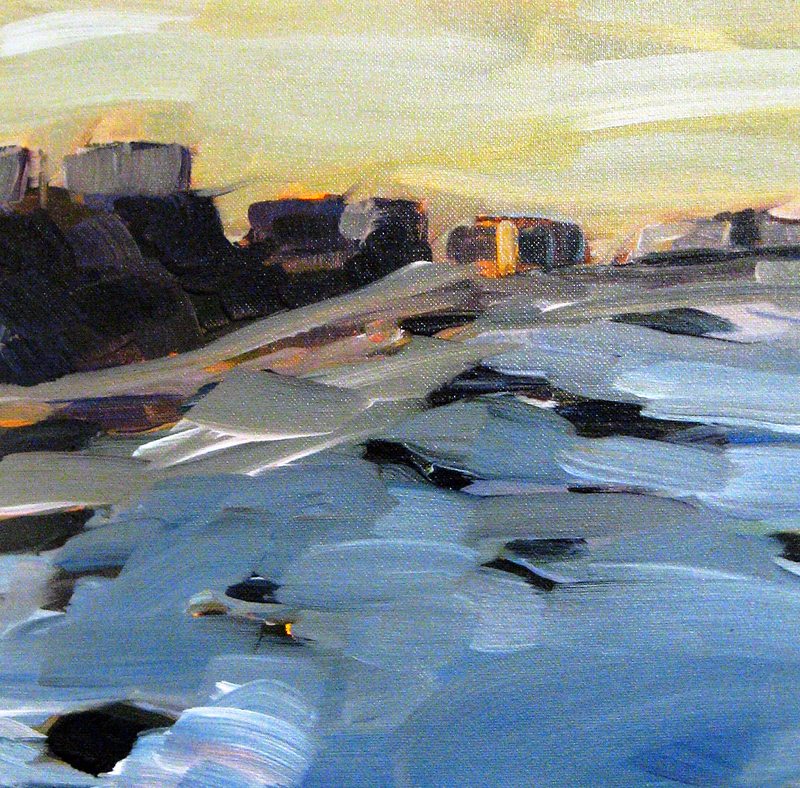 Another new layer was then carefully considered and re-worked again. These surfaces provide an enriching experience of discovery under close visual examination and when set out in a repetitive historical line formation, it was evident that the later panels had become less figurative and more open, fluent, and loose in structure. We briefly talked about her ‘worry dolls’ and specific sculptural pieces that were being made as a separate response to the idea of traces. These botanical inspired ceramic and metal works form a pleasing pattern of surface and shadow along the back wall. Damien uses a personal and intimate format to create images, usually of smaller scale. 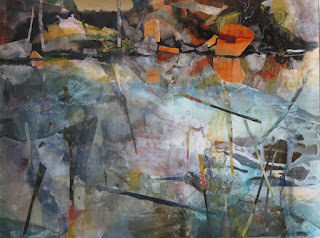 This show also includes larger work which offer space for open and extended mark making. The viewer must look closely into the work to discover the painterly magic within in much the same way as a viewer may peer into or out of a window to see what lies through the glass surface. In this new work he talked of a desire to replicate the intensity of light as it was encountered through, across and around these windows. This is a complex process and requires defined skill and expert examination. The task requires establishing the spatial relationships between the window pane and the interior and exterior objects. At the same time, each object and space may have a separate reflection onto, through and across the glass pane itself. 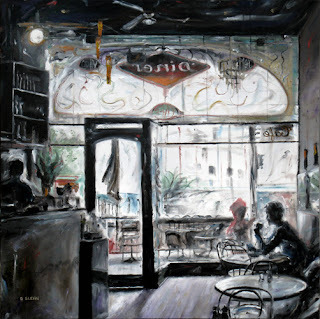 Damien layers these transitions with fine and believable detail and it is this detail that supports the charm and atmosphere that can be found in the familiar everyday haunts into which we all may venture. If I say these works are beautiful and charming, am I being dismissive in fine art academic terms by using these particular words. The works may evoke a memory of places visited, of shared experiences, of time spent unconsciously making such memories or connections. These images work for me especially in light of such definitions. It is in the everyday detail that the richness of life may often be found. Exhibition runs from 9th to 26th July with the gallery open Thurs - Sunday 12 to 5pm. I managed to catch up with three members of the group over the last week.. I found Jennifer Finnie working quietly away in Studio 20 at Newcastle Community Arts Centre and we spoke briefly about her art practice. She spoke about being drawn towards the likes of Fred Williams, Vincent Van Gogh and the Bay Area Figuratives amongst others. She spoke of the desire to capture the sense of being in the landscape, through sketching plein air whenever possible, then painting directly wet on wet alla prima style to capture the essence of the view in quick, direct mark making. When I left, Jennifer had set up a brand new pure white canvas in front of the window light. I wonder which work this has become in the exhibition. Perhaps Northern View along Newcastle Beach pictured below. ” Resolving the picture plane in terms of abstract composition while maintaining distinct figurative reference poses another exciting challenge for me ..... I am currently exploring this idea in various media." Jennifer Finnie. Formerly from the western suburbs of Sydney, Michael Bateman talked of his love of Newcastle. He walks from home to work past Newcastle’s primal iconic buildings, landscape and streetscapes, sighting whales and dolphins in the harbour. Here he sees at close hand the changing face of our city, the restored historical facades, the lost history of other buildings, transport infrastructure changes, and the alterations to our local spaces. 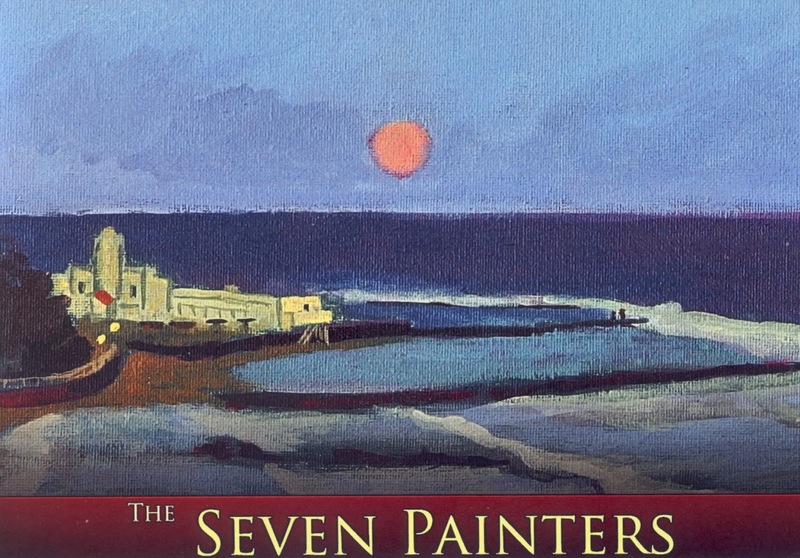 He commented that while the seven painters had been working away, they had simultaneously, without realising, been documenting the city’s history in paint and media. time is personal and precious. Here he immerses himself in his love of drawing. Michael talked earlier of the camaraderie, honesty and openness that had developed amongst the group and the trust they have for each other’s opinion. Patricia Williamsz was born in Northern Ireland and has worked in many professions including law and finance. She studied landscape design and is obsessed with landscape. Patricia discussed her art commitment as “an itch that has to be scratched”. 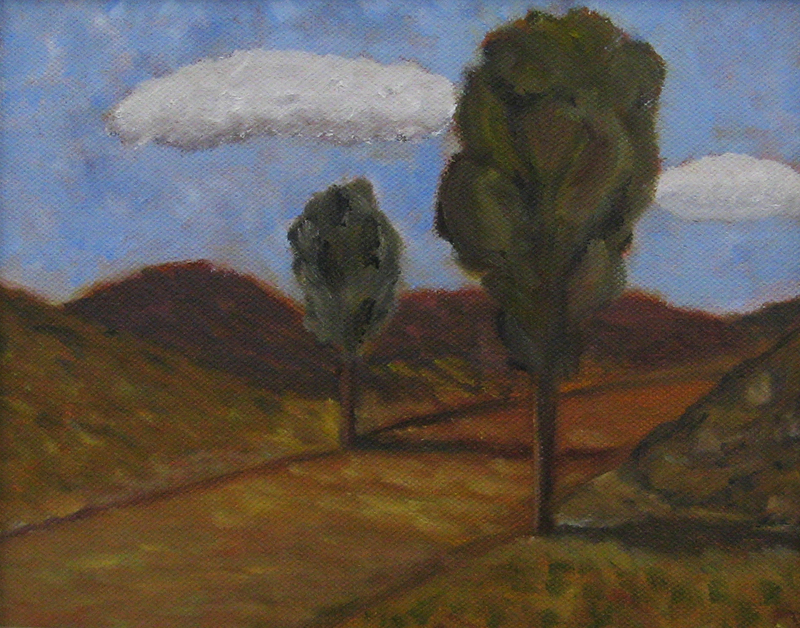 She immerses herself into the landscape, drawing plein air. She then puts away all her drawings, photographs and research materials in an attempt to capture the ‘essence’ of the experience of being in the space, through memory and emotion without further obvious planning. In this way she reacts to both the remembered experience and the direct response to the medium itself. 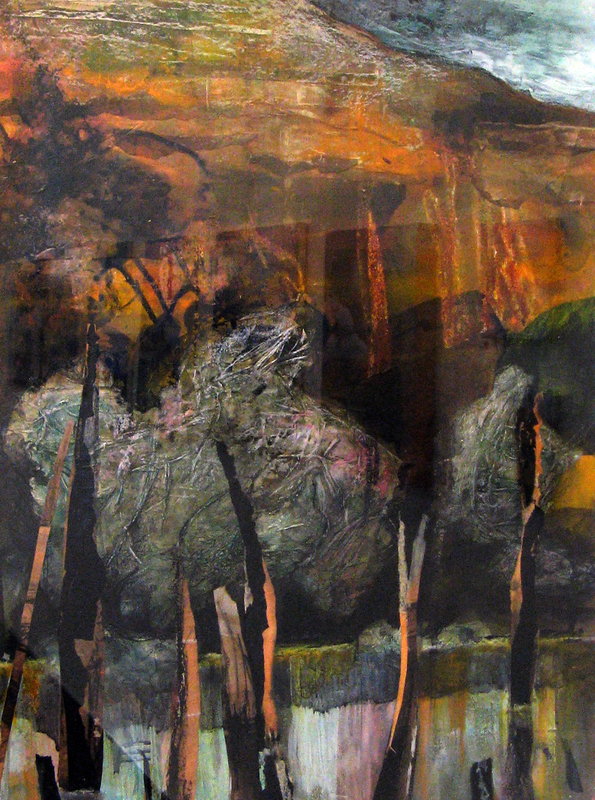 Patricia talked about the influence of the works of Judith White and her fascination with geology. As part of her process Patricia talked of sometimes scrubbing back and erasing surfaces and re-layering new marks, in the same way that the geology of the landscape is scrubbed backed and re-built layer upon layer over history. Andrew Finnie is a prolific artist working in digital animation, illustration, writing and painting to name just a few. His childrens' books are currently with a literary agent in New York hoping for publishing soon and he is sought after for his book illustration work. 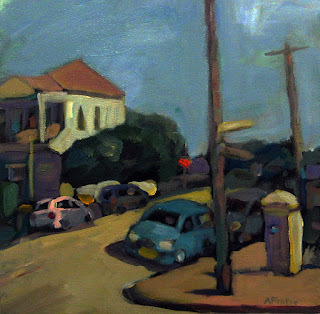 One of the original four of the (now) seven painters, his current work depicts local scenes of Newcastle, produced in his well established style. 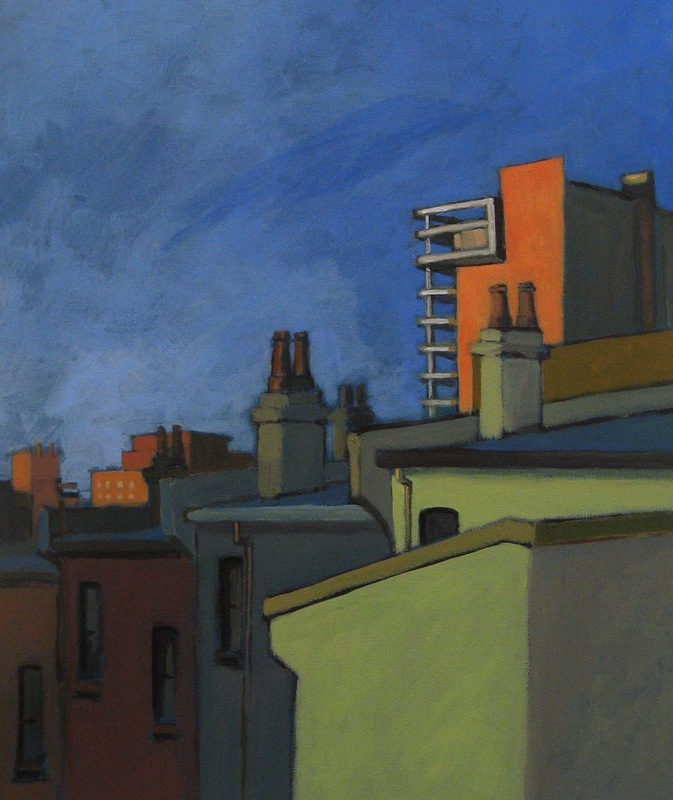 They reflect our local streets, the house next door and the changing face of Newcastle's architecture. These works are absolutely charming, filled with colour as they reflect an obvious joy of mark making with paint. 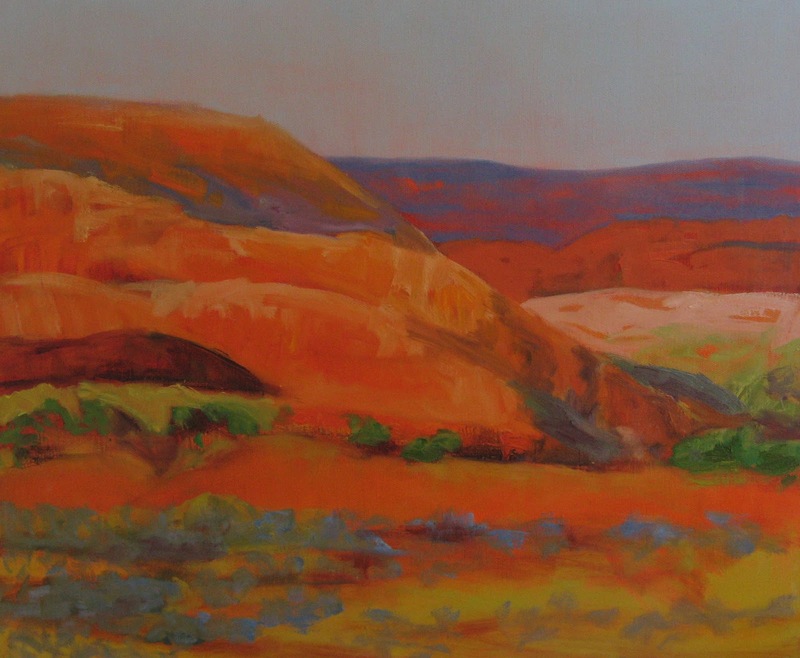 In the gallery Sarah's work reflects the light and colour of the Laparinta Trail. 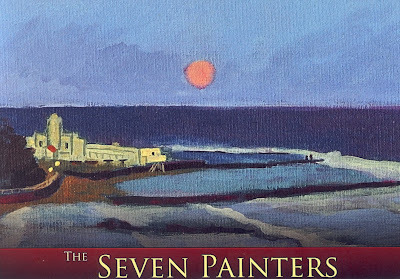 Sarah states in her CV that she began painting seriously only five years ago and has recently joined the Seven Painters Studio Group. In her statement she talks of the influence of Matisse, Arthur Boyd and David Hockney. Malcolm has just recently returned from Venice and I have not been able to catch up with him. Funnily enough, the influence I felt when I first viewed his work was Italian and they somewhat evoked a memory of my own travels in Italy and Tuscany. These works are small, personable and highly desirable. The perfect size to fit into any space in an office or home environment.